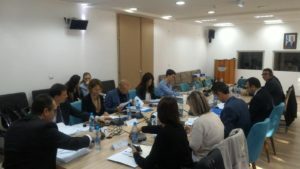 On October 11th, Ms. Stefania Lentinello, Program Officer of The Siracusa International Institute for Criminal Justice and Human Rights, attended the 8th Steering Committee of the Twinning Project “Strengthening Efficiency, Accountability and Transparency of the Judicial and Prosecutorial System in Kosovo” in Pristina, funded by the European Commission. The opening remarks of the committee were given by the project leader, Mr. Lavdim Krasniqi, and then additional remarks were given by the Italian project leader, Mr. Giulio Adilardi, by Mr. Shkelzen Maliqi, RTA Counterpart and Ms. Julia Jacoby, EU Office Task Manager. The Resident Twinning advisers, Ms. Maria Emanuela Guerra and Mr. Roberto Amorosi presented the Interim Quarterly Report.